Indigenous to Yunnan province in southwestern China, this species rose was named in honor of former director of the Washington Park Arboretum, Brian Mulligan, who helped sort out the plant’s identity. A vigorous rambler, it can climb up to 40 feet high, given adequate support. In June, it produces loose clusters of single, 2-inch-wide, fragrant white flowers with bright yellow stamens. These are followed by handsome, blood-red hips in autumn. Yellow and red fall foliage colors add to the attraction. 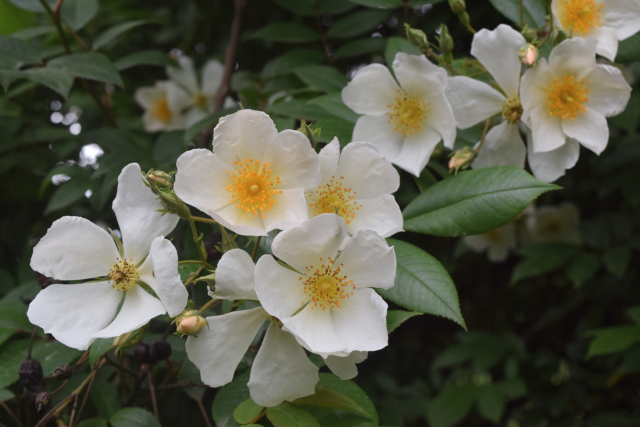 A Great Plant Picks selection for the Pacific Northwest, Rosa mulliganii thrives in full sun in fertile, moist but well-drained soil. It’s recommended for larger gardens only, with room for the rose to spread onto a fence, sturdy arbor, or big conifer. The best place to see the species in the Arboretum is in the Brian Mulligan Sorbus Collection, where a number of cuttings dating to 1990 have grown to impressive heights on top of some collection trees and western red cedars.